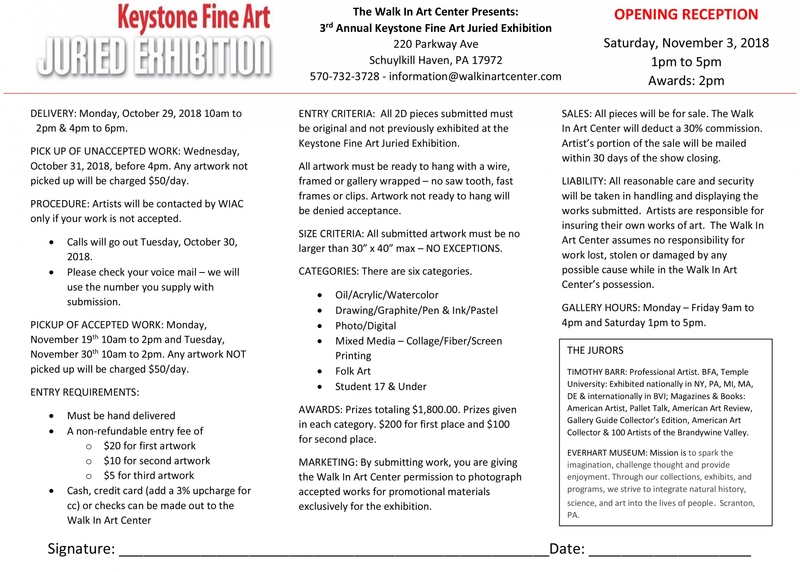 The Walk In Art Center Presents: 3rd Annual Keystone Fine Art Juried Exhibition. Delivery of Artwork: Monday, October 29, 2018 10am to 2pm & 4pm to 6pm. Pick up of unaccepted Artwork: Wednesday, October 31, 2018, before 4pm. PROCEDURE: Artists will be contacted by WIAC only if your work is not accepted. Calls will go out Tuesday, October 30, 2018. Please check your voice mail – we will use the number you supply with submission. PICKUP OF ACCEPTED WORK: Monday, November 19th 10am to 2pm and Tuesday, November 20th 10am to 2pm. Any artwork NOT picked up will be charged $50/day. 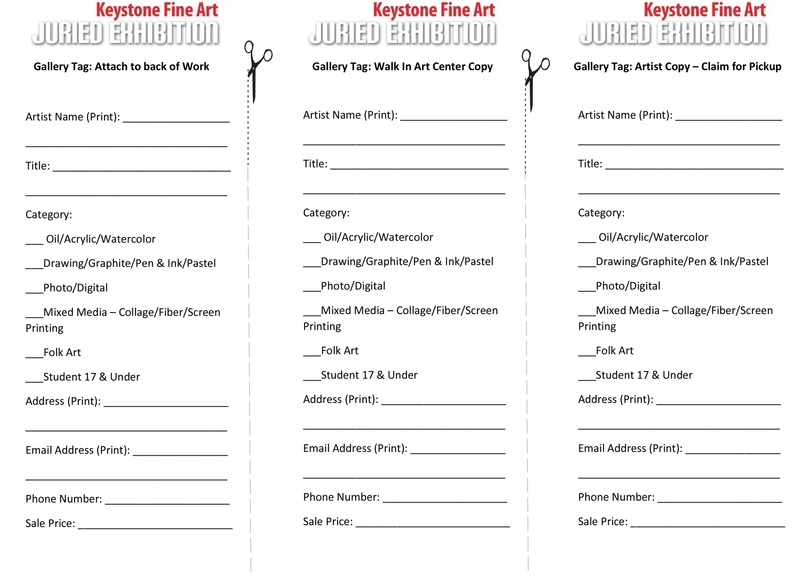 ENTRY CRITERIA: All 2D pieces submitted must be original and not previously exhibited at the Keystone Fine Art Juried Exhibition. All artwork must be ready to hang with a wire, framed or gallery wrapped – no saw tooth, fast frames or clips. Artwork not ready to hang will be denied acceptance. SIZE CRITERIA: All submitted artwork must be no larger than 30” x 40” max – NO EXCEPTIONS. AWARDS: Prizes totaling $1,800.00. Prizes given in each category. $200 for first place and $100 for second place. 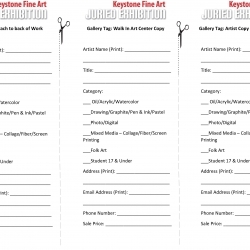 MARKETING: By submitting work, you are giving the Walk In Art Center permission to photograph accepted works for promotional materials exclusively for the exhibition. SALES: All pieces will be for sale. The Walk In Art Center will deduct a 30% commission. 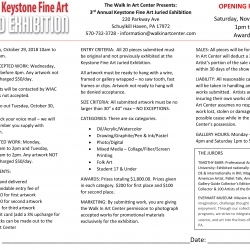 Artist’s portion of the sale will be mailed within 30 days of the show closing. LIABILITY: All reasonable care and security will be taken in handling and displaying the works submitted. Artists are responsible for insuring their own works of art. 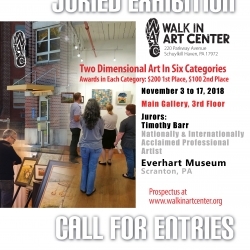 The Walk In Art Center assumes no responsibility for work lost, stolen or damaged by any possible cause while in the Walk In Art Center’s possession. GALLERY HOURS: Monday – Friday 9am to 4pm and Saturday 1pm to 5pm. Museum Professional, Artist, Art Historian, and Historian. Executive Director of the Morgan Log House, Lansdale, PA. Instructor of Art History at Kutztown University of Pennsylvania. BFA in studio art from Kutztown University, MA in art history from Penn State University, and an MA in history from Lehigh University. 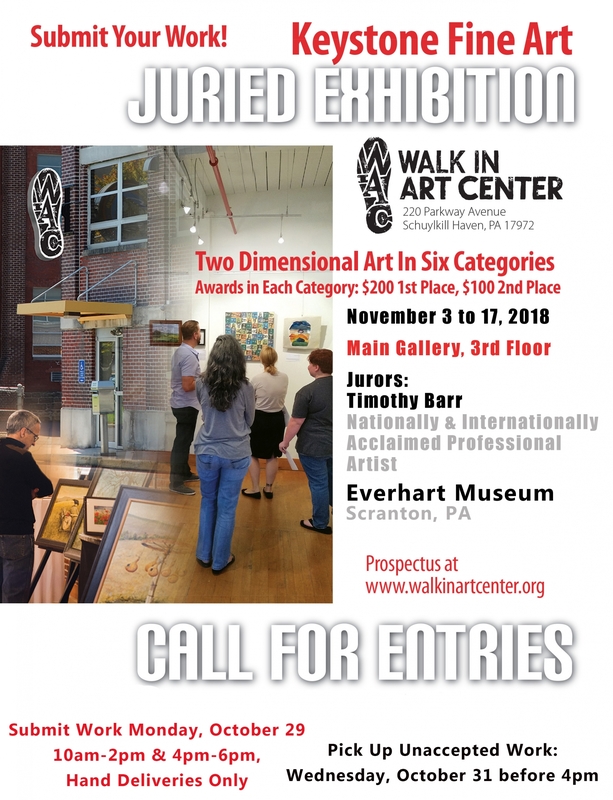 Exhibited personal artwork in NJ and PA.